Proprietary technology with over 20 sources of antioxidants to help combat the effects of aging. This product is not intended to diagnose, treat, cure, or prevent any disease. 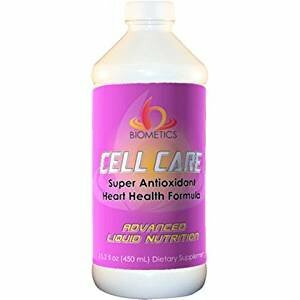 Super Antioxidant Heart Health Formula Over 20 sources of antioxidants in one great tasting fruit-flavored advanced liquid formula! CELL CARE is packed with antioxidants beneficial for all ages including Vitamin E, Coenzyme Q10 and Resveratrol. CELL CARE is an easy-to-take liquid supplement containing a unique blend of potent water-soluble and botanical antioxidant nutrients that are formulated to work synergistically for overall health. It also utilizes the NEW Biometics biocellular micellization® proprietary technology with over 20 sources of antioxidants to help combat the effects of aging. * *These statements have not been evaluated by the Food and Drug Administration. This product is not intended to diagnose, treat, cure or prevent any disease. Ingredients: Vitamin A, Vitamin E, Co-Enzyme Q10, Cranberry Seed Oil, Flax Seed Powder, Stevia Extract, Proprietary Antioxidant Blend, [L-Citrulline, Lutein, Lycopene, Zeaxanthin, Tocopherol, Resveratrol, alpha-Lipoic Acid], Proprietary Botanical Extract Blend, [Grape (skin), Black Currant (fruit), Purple Carrot (root), Rosemary (herb), Bilberry (fruit), Pine Bark (Pinnus massoniana), Green Tea (leaf), Ginkgo Biloba (leaf), Grape (seed), Turmeric (root).] Purified Water, Fructose, Ethoxylated Vegetable Oil, Glycerin, Natural Flavors, Citric Acid, Potassium Sorbate, Sodium Benzoate, Free of: Milk, soy, wheat, egg, peanuts, tree nuts, artificial colors, artificial flavors, starch, and yeast. If you have any questions about this product by Biometrics, contact us by completing and submitting the form below. If you are looking for a specif part number, please include it with your message. Quantum Eye Support, 240 caps / 4 Bottles - Premier Research Ocuven Vision and Eye Support, Including the Macula. Contains Lutein and Zeaxanthin.